He was a successful university dean; she was a prominent health professional. They both were entrenched in the comfort zone of a Crown Heights brownstone they loved. Their labor of love is the Wellington Herb & Spice Farm “which sits atop a hillside” offering “breathtaking” views of the Catskills’ Schoharie Valley. Annually they have offered visitors from around New York State and beyond a place to visit their “landscaped gardens” and “pristine grounds,” fish in their ponds and shop at their 4,000-sq. ft. country store for garden products, antiques, collectibles, herb and spice products, and jewelry. They also have herb classes, tours for all ages, a wonderful high-end art gallery and Carolyn’s great teas and homebaked goods. When we asked them if they had considered setting up a bed-&-breakfast to complement the hugely profitable and well-trafficked business, Carol answered with a question: “Why?” The Wellingtons are where they want to be in life, doing what they want to do, living their lives far away from the maddening world albeit in the midst of the bucolic wilds. • Identify ways to work through the challenges and it’s never too late until it’s too late. · Gardens are not made by singing, “Oh how beautiful” and sitting in the shade. Publisher’s Note: The following story was written by an African-American artist whose work was presented as part of an African-American exhibit, “Black Dimension in Art”, presented during 2008 in the Wellington’s Art Gallery facility which stands adjacent to the shop. Farming, once a proud tradition in the African-American community, is rapidly disappearing or gone altogether in the United States. However, the spirit limps along, buoyed by the tireless efforts of the older generation, who through community gardening try persistently to keep a grand tradition alive. Recently, quite by accident, I encountered an African-American who is bucking the trend and succeeding in spreading the joy of farming/gardening to small groups of African-Americans who periodically visit his farm. Dr. Frederick Wellington, an American of Caribbean descent, arrived in the U.S. in 1961 from the island of Grenada to pursue a course of study in veterinary medicine. He discovered only weeks before he began his studies that even with long hours of employment and his savings that he would not be able to afford the programs required. So with half of a soccer scholarship to Long Island University, he elected an alternative career path, hoping that he and his passion would be reunited at some point in the future. He earned instead a Baccalaureate degree in Psychology, and Master’s & Doctorate degrees in Education. Along the way, he became a college dean and an Associate in Higher Education with the New York State Education Department with responsibility for the review of undergraduate and graduate degree programs. In 1998 and 1999, he played a significant role in the review of the new, higher teacher-education standards, and shepherded the entry of the fledgling and innovative “Teach for America” program into the state. 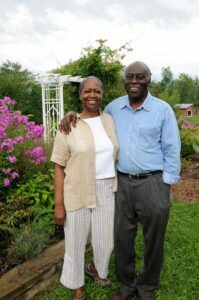 Now retired, Dr. Wellington with his Georgia-born wife, Carolyn, live on a 45-acre farm in the fertile Schoharie Valley region between the Catskill and Adirondack Mountains, after having restored the land from its former abandoned state. Eighteen of those acres are now certified for organic production. Wellington’s Herbs and Spices, a business which the Wellingtons operate on the farm, sits on top of a hillside that overlooks this beautiful valley aptly dubbed the “Breadbasket of the Revolution” for the role it played in providing sustenance to the stalwart continental soldiers. WHS is considered a very small producer in the grand scheme of New York State farming. Almost 100% of their crops are grown organically. When for reasons of climate or other influences they cannot grow an organic product, they exercise an unwavering vigilance in the selection of a produce source before they offer that product to their customers. The largest crops grown by the Wellingtons are collards, hot peppers, basil, string beans, rosemary, mints, oregano, lemon-verbena, thyme, cherry tomatoes and leaf lettuce, but thyme is numero uno! During my visit to the farm, more than five thousand plants were being transplanted that day by a team of students from the neighboring SUNY Cobleskill College. Wellington’s Herbs and Spices also sells a large variety of imported teas and herbal tea blends. For more information about the complete inventory of merchandise and service, visit their Web site: www.wellingtonsherbsandspices.com, now being redesigned to accommodate online shopping. E-mail: ginger@midtel.net, or telephone: 518-295-7366. But when they decided to retire, Carolyn and Frederick Wellington didn’t hang it up. They went to work, joining nearly 9 million Americans between the ages of 45 and 70 who have reentered the workforce in recent years. But this second time around, they are in careers that are more personally meaningful and have social and far-ranging community impact. Next articleAging in Our Time / Who Are the Caregivers?